My now boyfriend and I attended an event for the first time in June 2015. We both had our eyes on each other before he got to my table and once he did we clicked instantly. Since then it's been nothing but happiness. We both are amazed by how well suited for each other we are and how it seems we've known each other for far longer. We always talk about how crazy it is that if it wasn't for weekend dating we would never have met and we both had circumstances that almost prevented us from being there. I didn't know I could love someone as much as I love him and I am so thankful that your event brought us together. We tell our friends that they have to do it too because it really works. Because of you I met the man I intend to spend my life with. Thank you so much! 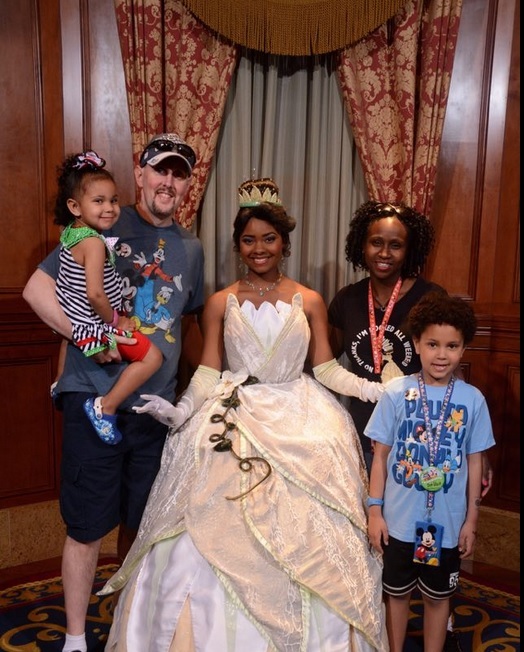 Lance and Theresa met at our Northern Lights, Stamford Mariott event and got engaged in February 2017. Watch this! I know you keep track of your "success stories" (engagements and weddings, happy couples, etc). I thought I would tell you that you can add another engagement to your list! Rob and I met almost 3 years ago at one of your Suffolk speed dating events. I had been to approximately 5 other events prior spread out over a couple years and always had more luck with speed dating than I had online. Rob had never been to one (he got lucky his first time out lol). Anyway, a married couple who had also met speed dating was running the event that night. It was a lot of fun as always. Rob said he drove by the place several times as his friend who was supposed to go that night too cancelled and he was thinking of backing out. I am so glad he didn't!!! April 2019: Hi Jay, I just wanted to let you know that Morris and Olga met 3 years ago at your event and we are getting married on May 12th. Thanks! Just wanted to let you know that exactly a year after I met John (he was actually waitlisted) at your event we got engaged. We will be married next June. I've been telling anyone who asked that they should definitely try weekend dating and that I thought the people at your event were nicer, more down to earth people than the people you meet at speed dating events in the city. Don't leave, at least stay and have something to eat. Never could I have imagined that these special 10 words was going to change two people's lives forever. One of my favorite motivational speeches is by Al Pacino in the movie Any Given Sunday. "You find out life's this game of inches, so is football. Because in either game - life or football - the margin for error is so small. I mean, one half a step too late or too early and you don't quite make it. One half second too slow, too fast and you don't quite catch it. The inches we need are everywhere around us." Lets rewind exactly one year ago from this past Sunday to August 10, 2013. I was hosting a singles BBQ in Bethpage. This was Jackie's first ever event. The BBQ's are a lot of fun and are very informal. At this particular event the ages was skewing a little "older." Jackie hung out for a bit and then let me know that she was going to leave. I could tell that she was keeping a brave face, but the guys were a little bit too old for her. Then I said those magical 10 words. "Don't leave, at least stay and have something to eat." I let her know the food was coming out shortly and she agreed to stay for a bit. I called Omar (who was closer to Jackie's age and had expressed some possible interest in attending the BBQ) and told him that we had some cute younger women in attendance and he should come down and register. Omar said that he was with Chris and that they were going to the city but would try to stop by on the way. Thankfully they did because as the story goes...The rest was history. Lets fast forward to this past Sunday, August 10th, 2014. It was an honor to have been invited back to the place where it all began. Chris proposed to Jackie and she accepted!! It really made me think about that Al Pacino speech. What if Jackie had left early and not stayed for the food? What if Omar and Chris decided to skip the BBQ and go straight to the city? "One half a step too late or too early and you don't quite make it. One half second too slow, too fast and you don't quite catch it. The inches we need are everywhere around us." I will keep this story in mind the next time I want to leave someplace early or decide that I really do not want to do something.. You just never know how not missing that experience could have a tremendous impact on your life. 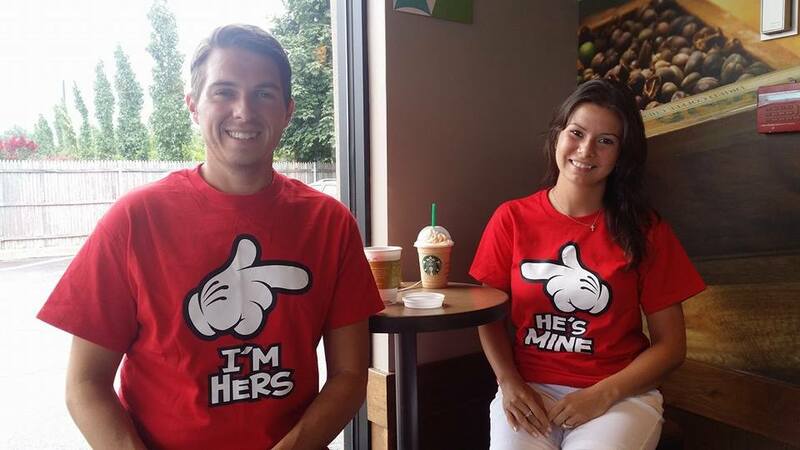 Congrats to the engaged couple! Congrats to Brian and Suzanne!! 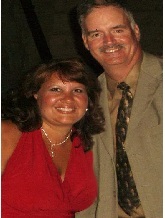 They met December 2011 at our 841 East Lounge Speed Dating event in Huntington! "It was an interesting night; the chemistry between us was undeniable, magical, a bolt of lightning. The rest is as they say history. We are engaged now and are in the process of moving in together. We couldnt be happier. Thanks for getting us together. Jay, just wanted to thank you! Bill and I just got engaged! We met at one of your events at 34 New Street in Huntington. Wedding date set for May this year! Thanks a million! You changed our lives!! Update: We are now married!!! Things usually come in threes.. This is the second great bit of news in just a few days.. So who is next?? A JEWISH SALSA DANCER! That's what Simone told me that she wanted. I said.. "YOU ARE CRAZY, NOT GOING TO HAPPEN." Well as the saying in lotto goes... You never know.. Simone met Bill at our 34 New Street event in Huntington and have been happily married for years! 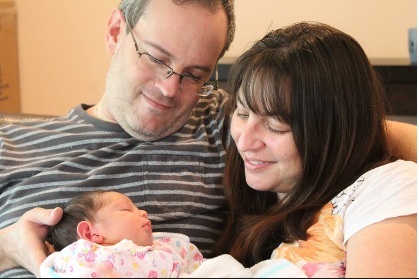 They JUST HAD THEIR FIRST LITTLE GIRL!! CONGRATS TO THE AWESOME COUPLE! I hope all is well by you!! On November 2, 2009, I had the pleasure of reuniting with nine couples whose lives have changed forever. I took them to dinner at Allettos in Lindenhurst. If I had any doubt about the true purpose of WeekendDating.com, those doubts were put to rest. The event went so great, that a couples reunion will be planned once or twice a year. On November 2, 2009, I had the pleasure of reuniting with nine couples whose lives have changed forever. I took them to dinner at Allettos in Lindenhurst . If I had any doubt about the true purpose of WeekendDating.com, those doubts were put to rest. The event went so great, that a couples reunion will be planned once or twice a year. Jay, hello to you! 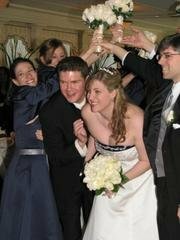 I attended an event at Katies (Smithtown) in November of 2006 where I met my (now) fiance. I wrote you in 2007 to let you know that we were moving in together, now I would like to let you know that we are getting married. We were engaged last October at Niagara Falls! We will be married this coming October. I thought you would want to know about another successful match! Thanks for all of the good you do to help couples find each other. Peter and I are still dating since your event March 2008. We are now living together. We are wishing you happy Holidays and a very happy New Year. 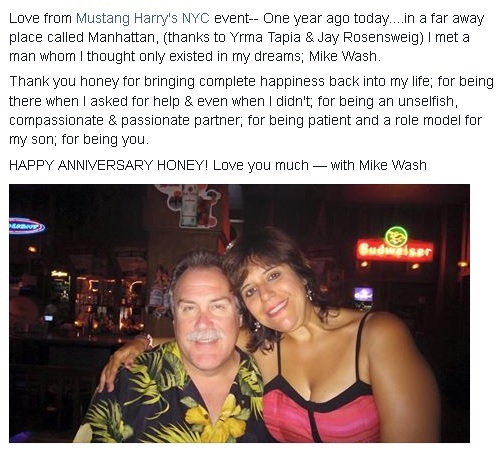 UPDATE July 2017- Tom and Tracy have been married for many many years. 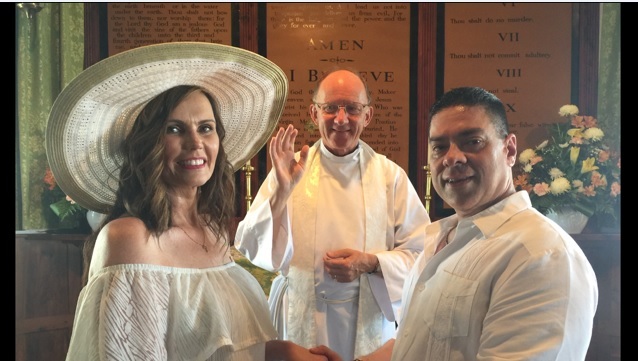 They just went to Bermuda and renewed their vows! I just wanted to tell you that I attended one of your speed dating events about 4 years ago. I matched up with a really nice girl, and this past April we got married. Things are great, we have a house in Wantagh and are very happy. I just wanted to say, thanks for doing the events, your doing great things. Your very appreciated. Just wanted to inform you that Anthony and I had met at your party at Cats Meow last year and we tied our knots 8/06. I was just cautious about our names being displayed that was the reason that I delayed this information. It's a grand service that you have been doing to the community at a very reasonable price. I just wanted to let you know that I met Jerry at one of your speed-dating events in March of 2005. We were engaged in February of 2006 and were just married in July. Just want to say that I met someone special at your October 18 event at Sly Fox. (It was my 2nd event - I was supposed to be out of town, but you had one extra spot for women. You said, "Maybe it is meant to be"...and it's been pretty great these past nearly six months. Chris was totally there for me during the holidays, when my dad passed away in January, etc. Just wanted to let you know. I have been referring friends/acquaintances to weekenddating.com. Don't know if you remember me, we met a few times at the Cat's meow. You bought my baby g/f a pizza, she was the young blond hanging out at the bar. Anyway dear.... I've been meaning to tell ya that at the single thingy, last year, around this time, end of June, I met Gary. We have been dating now a year and are very much in luv. Just wanna say ty for having these speed dating events. He and I get along so well. Anyways I'll keep in touch. I attended your speed dating event in September 2005 at the Salty Dog in Bay Ridge, Brooklyn. I met Adam at the event and we've been together ever since. Thanks so much! Thank you, Thank you, Thank you (I truly would never be able to thank you enough) for creating that night that brought me such a wonderful person. Sorry this is so long but I thought you would appreciate the feedback and if anyone ever gets discouraged (and God knows I had my moments) you can tell them about my story. Hopefully, this is only Chapter one of a very long book. Hello. 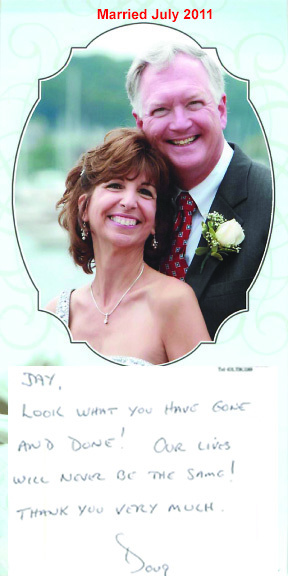 this letter is for jay. it is catherine, jen's friend. well nick and i are engaged and getting married 11/17/06. we went to the bruno's event, march 26. i almost left and he decided to go at the last minute. 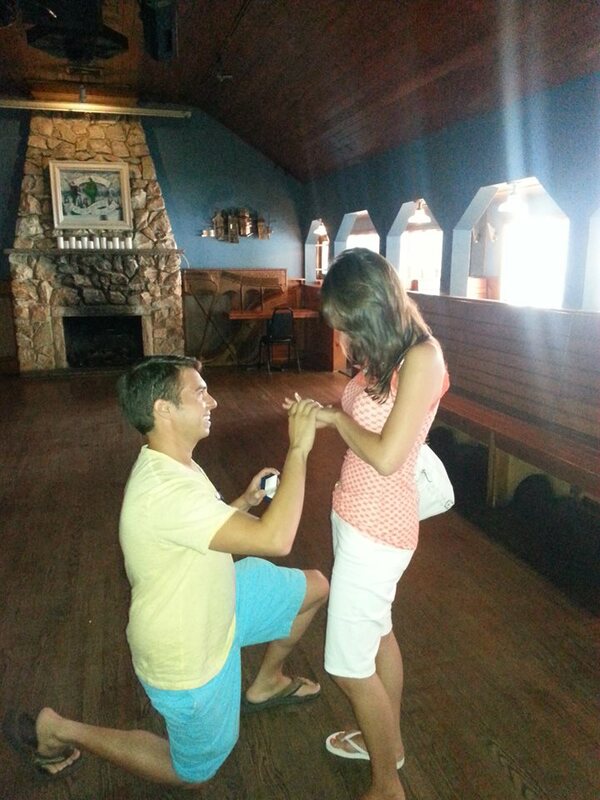 we talked about marriage about 4 months later and were engaged 5 months later. well its official mark and i are engaged as of christmas eve! we owe our initial meeting on Friday June 18, 2004 at Brennan's to you! we couldn't be happier and wish you much success. HI Jay. FYI. Dan and I who met at one of your events one year and ten months ago and a half are now getting married! Thank you very much for telling me about that singles event. I been dating this wonderful guy for 2 months already. My friend was interested in attending your events, but I wasn't sure if you had the slightly younger age group like the one I attended. She is 30 years old and wants to meet someone from like age 27-35. I told her I met someone at the cats meow and maybe you would have one of these events again. I hope you have a great weekend and thanks again. Just want to drop you a note and holiday greetings. 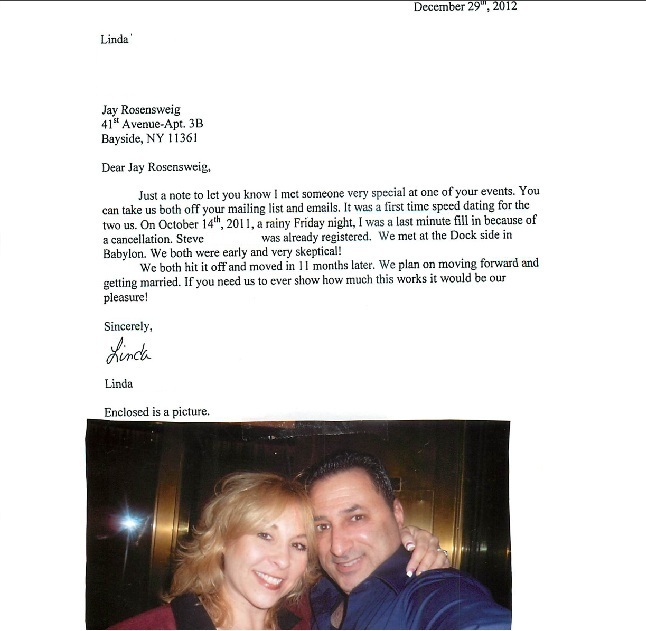 Lisa H and I met at one of your dating events in Brooklyn in April. It was the first for both of us. I am happy to report that we have since been married and have relocated to Pennsylvania. We just closed on a house and we are moving in tomorrow. 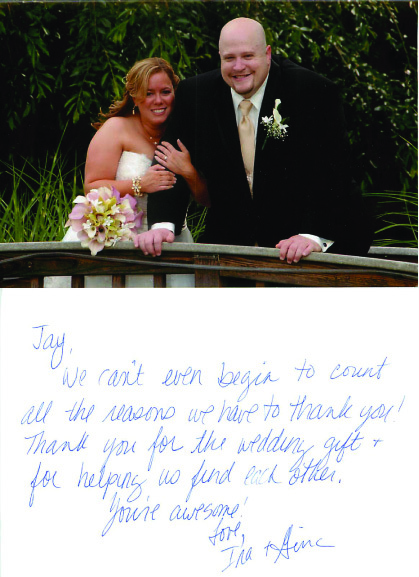 We be happy to participate in a success story as we both feel so fortunate in meeting through your social. Just wanted to let you know that I attended the event at Jillians on February 12th and met a great guy. We have been dating ever since and I just wanted to thank you. You no longer have to send me the emails about upcoming events because I know this is "the one". Thanks again. Just wanted to let you know that Joe and I got engaged last month. Both of us wanted to let you know we are thrilled that we met one another at Speed Dating and would highly recommend it to anyone!!! Last fall I came to your Hauppauge speed dating and had a wonderful time and went on a few dates. It has been nearly 30 years since I have been single. From those dates I was able to build some dating experience and confidence in dating. I found this whole experience to be very positive. After dating several months and even more confident I was ready to try speed dating once again at your Farmingdale location just two months ago. I had even more fun and 1000% more confident and relaxed. I went on some more dates but was really interested in only two super ladies, it didn't take me long to realize my connection was with "Cookie" not her real name and we have been together ever since. Cookie and I really knew the very first night how special we were as a couple. What a great service you provide and professional way you run your service. Thanks so much. I want you to know .. it may sound korny but thank you for having your speeddating.. if not for you, I would not have such a wonderful boyfriend and I am very greatful for that. 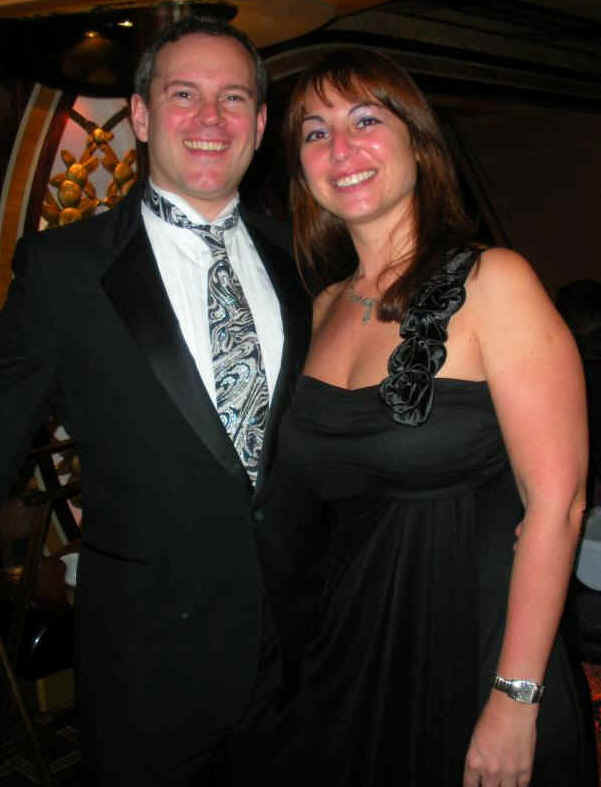 Update: Monica and Dom married on February 15, 2009 and have two beautiful children!When they met for the first time at our speed dating event.. .they DID NOT pick each other. They met again at a subsequent event and the rest was history! Hi. It's Barbara, the first speed dating ticket winner. Well, it's still early but I thought you would appreciate the feedback and the story. I went to the second night, largely to meet up with your friend Dave and because I won the ticket. I took the winning of the ticket as a sign. My mom died when I was little and she has been giving me signs all along. Well, turns out one of my matches and I really hit it off. The first time I tried speed dating, I approached it with expectations of having fun ... I didn't expect anything to come out of it. Imagine my surprise when something actually did! Of the six matches I had that night, I met with three about one week after you introduced us. Bachelor #1 didn't appeal to me and Bachelor #3 made me feel as if were at the dentist. However, Bachelor #2 made quite an impression. John (#61) and I met at 2 PM on a Sunday afternoon for coffee. We immediately started talking and at about 5 PM I asked him if he wanted to get something to eat because I was starving. We sat in the restaurant until 9 PM. We would've stayed longer, but I had to get up early for work Monday morning. After a seven hour first date, we both had an idea that something good was going to happen! That was almost two months ago and we've been inseparable ever since. Thank you for bringing two people together who probably wouldn't have met otherwise.